This entry was posted in Uncategorized and tagged baking, Brown Sugar, Cinnamon, comfort food, cook, Cooking, Cottage Cheese, Egg Noodles, Eggs, family, home, Mellow Yellow Monday, Noodle Kugel, raisins, Sour Cream, White Sugar by hibernationnow.wordpress.com. Bookmark the permalink. 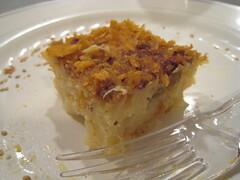 Noodle kugel – my favorite. Reminds me – I have a recipe, somewhere, that uses decadent ingredients with a slight lemon flavor. I rarely make it cuz I eat the whole pan. I only had it last night because it was so good, tonight I resisted and put the rest in the freezer. Lemon? 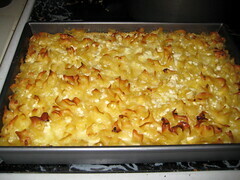 yum, in case you find the recipe let me know…I’m thinking of putting in apples next time. I could live on this comfort food. Love, PK Jr.
Yum! At first, I thought no, I don’t want egg noodles, but then I saw sugar, white and brown, and the warm looking pan of what looks like some good comfort food. I might try this if I can remember. Wishing you well my friend, and of course, a Happy New Year! Thank you and I’d love to have the recipe! If I forget, pls remind me, you know I have Fibro Brain! !